Karabayram said that the ancient artifacts of Perga were well preserved since Prof. Dr. Jale İnan started excavation works during the 1980's. The monument director also underlined that 2018 was named "The Year of Perga," adding that the restoration of Perga's ancient theatre was discussed during Culture and Tourism Minister Numan Kurtulmuş' previous visit to Antalya and the historical site. 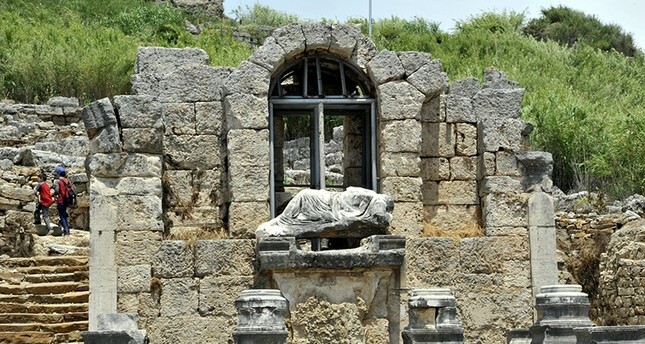 Perga's ancient theater was previously closed to public due to some security issues, however after preliminary examination, a safety corridor was formed so that domestic and foreign tourists can visit the ancient city of Perga. The ancient city awaits over 250,000 visitors in 2018. Around 70 percent of Perga remains underground to be discovered, as archaeologists continue excavations to reveal its hidden beauties. Archaeological excavations have been taking place in Perga since 1946. The sarcophagus of ancient Greek divine hero Heracles was also discovered here and was recovered from the Geneva-based Phoenix Ancient Art Gallery years after it was smuggled.